Everything Underground partnered with The Indianapolis Black Chamber of Commerce to kick off the third annual Trailblazer Awards. The Trailblazer Awards recognizes and celebrates overlooked and under-appreciated individuals in multiple fields with impressive accomplishments and long records of community service. The show will be co-hosted by Miss Black America Brittany Lewis and Comedian China Doll. 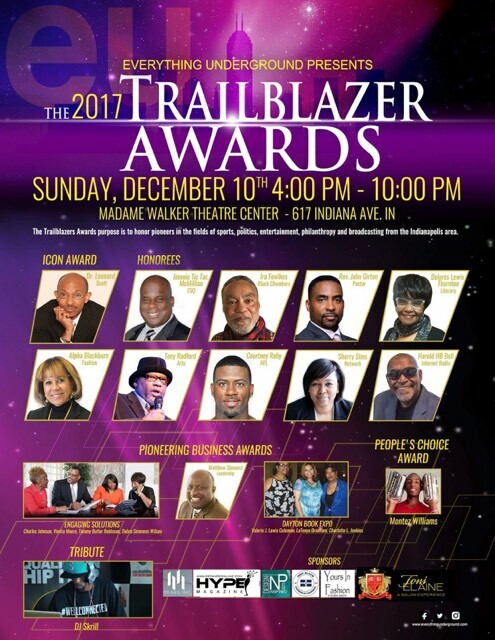 The Trailblazer Awards are the creation of Everything Underground, an Indianapolis-based organization dedicated to community uplift and empowerment. The award show is designed to spotlight pioneering figures in the fields of sports, politics, entertainment, philanthropy, and broadcasting both in Indianapolis and nationwide. This year’s event has a special Midwestern focus, featuring award winners from across the Midwest. Everything Underground is thrilled to have USA Track & Field Chief Revenue Officer and Indiana Hall of Famer David Gadis be the keynote speaker at the Third Annual Trailblazer Awards. The ceremonies take place this Sunday December 10th at the historic Madame Walker Center in Indianapolis beginning at 6:00 pm and doors open at 5:30 pm. An ever evolving show this year's awards will include some new categories and honors. Dr. Leonard Scott, the distinguished gospel composer, will receive the Lifetime Achievement Icon award. Indianapolis community activist and entrepreneur Montez Williams, has partnered with the Ross Foundation in hiring previously unemployed young people to rebuild and improve conditions in some of Indianapolis’ toughest neighborhoods. He is the first recipient of the Freeway Rick Ross “Changed” Award, which goes to a person that has overcome past hardships and is now making positive contributions to society. Another new feature is the Millennium Salute by Purdue Graduate, Tanisha Adams, which brings a different, youth perspective to the Trailblazer Awards. The 2017 ceremonies’ Fashion Tribute features an exclusive showcase of designs created by Trailblazer honoree Alpha Blackburn. The Third Annual Trailblazer Awards are sponsored by EU Network, The Hype Magazine, Dears Foundation, Your In Fashion, Tony Elaine Salon.